CHICAGO (AP) — Under the bright lights of the popping flashbulbs, Jerry Harkness grasped the magnitude of the moment. There he was on that day in March 1963, a black player from Loyola of Chicago shaking hands with a white player from Mississippi State, Joe Dan Gold, at center court. They were about to tip off in a regional semifinal in East Lansing, Michigan, that would come to be known as the Game of Change. “Boy, the flashbulbs. I couldn’t believe,” Harkness recalled this week. “I just couldn’t understand. … I was shocked. I looked him in his eyes. He didn’t smile; I tried to smile at him. I could tell he was there, he was happy to play us and he was happy to be there. He had on his game face. I was shocked with the bulbs and I went back to the huddle in kind of a daze, a little. Loyola is back in the Sweet 16 for the first time since 1985 thanks to two last-second shots and two prayers answered for Sister Jean Dolores Schmidt, the 98-year-old team chaplain who has become a celebrity during this captivating run that continues with a game against Nevada on Thursday night in Atlanta. It’s also shining a light on the team that blasted through racial barriers 55 years ago. With four black starters, Loyola won what remains the only NCAA Division I championship by an Illinois school. And for the players who were there, the current run is bringing back all sorts of memories. From the taunts in Houston to the death threats mailed to their dorm, from the biggest blowout in NCAA Tournament history to the Game of Change and beating Cincinnati in overtime to win it all, it was unforgettable. Three years later, Texas Western with five black starters beat Adolph Rupp’s all-white Kentucky team for the championship. But the Ramblers ad started paving that glory road, whether they realized it at the time or not. They saw the obstacles in front of them, heard the insults thrown their way. Miller remembers coming off the bench the previous season because coach George Ireland was following the unwritten rule that teams could play one black player on the road, two at home and three if they were way behind. A loss in the NIT and pressure to win switched his thinking. The crowd in Houston late in the season was particularly brutal, hurling insults and throwing water and ice and even pennies at the players. “That was the only time I was truly fearful of what might happen,” said center Les Hunter, who was from Nashville. The death threats, Harkness remembers, came after Loyola opened the NCAA tourney by beating Tennessee Tech by 69. The game played a few miles from campus at Northwestern remains the biggest rout in tournament history. 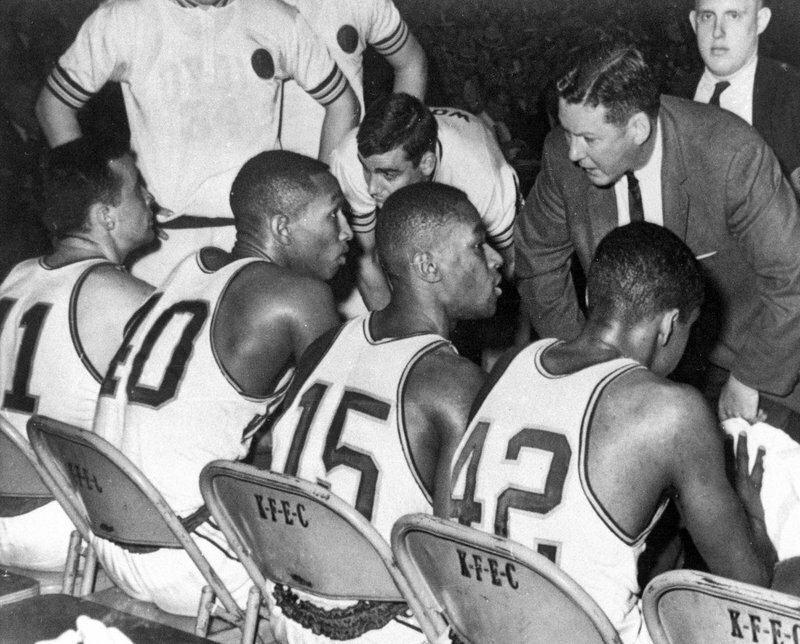 It put the Ramblers in the regional semis against Mississippi State and that led to some ugly letters from Ku Klux Klan members, calling them names and saying they had no right to play, arriving at the dorm on Sheridan Road. The fact that the writers knew where the team lived was unnerving to Harkness. He got two of those letters, some were sent to other teammates. Ireland wound up taking them, dismissing the threats as junk. While the Ramblers dealt with threats, their opponent had to figure out a way to get to the game. Mississippi State’s coach and school president wanted the team to play in the tournament despite an informal rule barring the state’s schools from playing against racially integrated teams. The Maroons, as they were known at the time, came up with a plan to slip away and fly to the game in Michigan, avoiding an expected court order. The game itself had no such off-court drama. Loyola won by 10 and beat Illinois and Duke before dethroning two-time champion Cincinnati. The final — featuring a combined seven black starters — saw the Ramblers rally from 15 down in the second half to win 60-58 in overtime on Vic Rouse’s tip-in . “So much went on back then,” said Harkness, who later became friends with Gold. About a month after the Game of Change, Martin Luther King Jr. penned his famed “Letter from Birmingham Jail” defending the strategy of non-violent resistance to racism. In 1965, Mississippi State admitted its first black student. With Loyola in the Sweet 16, Harkness has been thinking about that time — and some more recent tensions, including the deadly white supremacist rally in Charlottesville, Virginia, last August.